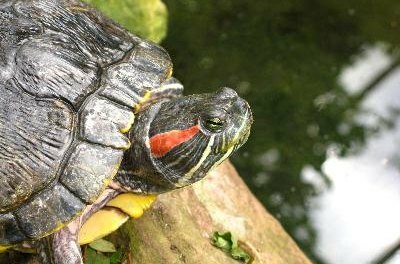 Red-eared sliders are often kept as pets. 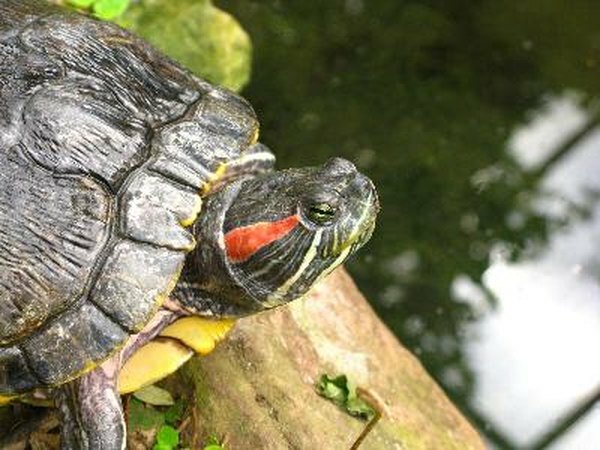 Turtles such as red-eared sliders and cooters are popular aquarium pets that thrive with proper care. Nutrition plays a major role in their health and development, so it's important to feed a healthy diet. Turtle species vary in terms of dietary needs, so consult care guidelines for your specific turtle. All turtles need fruits and vegetables for proper growth. Good vegetables for most water turtles include kale, dandelion greens, mustard greens, turnip greens, collards and carrots. Most turtle species need significantly more vegetables than fruit or meat as adults. Give fruit in smaller quantities, every other day or so. Too much fruit can cause digestive problems. Good fruits include bananas, tomatoes, raspberries and blueberries. Many turtle species, including red-eared sliders and cooters, are primarily carnivorous as babies. Give a variety of meats including brine shrimp, feeder fish such as goldfish, snails and cooked table meat such as chicken and beef. When you feed your turtles live food, ensure that the food has eaten a healthy diet. For example, give feeder goldfish high-quality fish flakes, because this nutrition will be transferred to your turtle. As your turtle grows older, he will likely eat significantly less meat. For most adult turtles, meat should be only 10 to 30 percent of their daily food intake. Prepackaged turtle food is an easy way to ensure your pet gets a variety of foods and vitamins. Whole prepackaged food such as frozen turtle cubes and freeze-dried veggies are generally healthier choices than pellets because they contain fewer filler items. While turtle pellets work on a short-term basis, they should not constitute your turtle's sole source of nutrition. All turtle species thrive when they eat a varied diet, and prepackaged foods don't typically offer this important variety. Water turtles need significant quantities of calcium in order to remain healthy. Lightly dust your turtle's food with calcium dust -- available at most pet stores -- daily. Your turtle also needs access to UV light to properly metabolize calcium. Outdoor turtles get UV light from the sun, while indoor turtles should have 12 hours of light from an artificial UV bulb. Without UV light and calcium, turtles will quickly develop metabolic bone disease, a life-threatening condition.